Tickets are available now to experience the theatrical phenomenon that is Wicked at the Gershwin Theatre on Broadway... “One Short Day in the Emerald City” and you’ll be hooked for life! Based on the best-selling novel by Gregory Maguire, Wicked has become a global sensation and arguably the most lavish and spectacular musical the Great White Way has ever seen. After completing its pre-Broadway engagement at San Francisco’s Curran Theatre in April 2003, the production officially opened at the Gershwin Theatre on October 30, 2003, following previews from October 8. Wicked went on to pick up an impressive total of ten Tony Award nominations in 2004, including “Best Musical,” ultimately winning three. Eugene Lee and Susan Hilferty were rewarded for their grand and exquisite scenic and costume designs, respectively, with the third trophy going to original cast member Idina Menzel. Scoring the popular actress her first ever Tony Award, her portrayal of Elphaba and her co-star Kristin Chenoweth’s portrayal of Glinda, elevated the pair into Broadway superstardom and remain among the most identifiable and iconic performances in Broadway history. Composed by musical theatre legend Stephen Schwartz, the score of Wicked has been celebrated the world over and also won the Grammy Award for “Best Musical Theater Album” in 2005. From its anthemic “Defying Gravity” to the more playful numbers such as “Popular” and “What is This Feeling?” to tear-jerking ballads like “I’m Not That Girl” and “For Good,” the music ticks every box of a musical theatre essentials list. The songs also tend to grow on you through repeat attending and listening to the cast recording over and over again, so sometimes one trip to Oz just isn’t enough. Produced by Universal Stage Productions, the original plan was for Universal to adapt Gregory Maguire’s novel into a feature film, however, after a little persuasion from Stephen Schwartz, who had read the book and developed his own theatrical interpretation, Universal agreed to co-produce the property as a stage musical. That decision has become a fatefully profitable one with Wicked evolving into one of the top-earning brands for Universal. The original plan for an intended movie adaptation did come into fruition, however, with Universal announcing a release date for the film adaptation on December 20, 2019. Until then, catch all the wonder and spectacle of Wicked live at the Gershwin Theatre! Your friends will be green with envy! Ginna Claire Mason debuts as Glinda in the Broadway company of the long-running hit musical Wicked at the Gershwin Theatre tonight, as scheduled, assuming the role from Katie Rose Clarke, who played her final performance on April 7. Aside from starring as Glinda in the National Tour of Wicked, Ginna Claire Mason has also appeared in the National Tours of Flashdance and Disney's Newsies. Her regional credits include the Las Vegas production of Duck Commander: The Musical, as well as Thoroughly Modern Millie, Hairspray and Grease. She IS that girl! Hannah Corneau is set to make her Broadway debut on May 14, 2019, when she assumes the leading role of Elphaba in the long-running hit musical Wicked at the Gershwin Theatre. Current star Jessica Vosk will play her final performance in the role on May 12. Hannah Corneau has previously starred as Yitzhak on the National Tour of Hedwig and the Angry Inch and her other regional and off-Broadway credits include Daddy Long Legs, Renascence, Evita, Fiddler on the Roof, Harmony, Les Misérables, Bloody Bloody Andrew Jackson, and A Little Night Music. She's going to be popular! Ginna Claire Mason is set to join the Broadway company of the long-running hit musical Wicked at the Gershwin Theatre from April 9, 2019, assuming the role of Glinda from current cast member Katie Rose Clarke. Ms. Clarke is set to play her final performance on April 7. Aside from starring as Glinda in the National Tour of Wicked, Ginna Claire Mason has also appeared in the National Tours of Disney's Newsies and Flashdance. Her regional credits include the Las Vegas production of Duck Commander: The Musical, as well as Thoroughly Modern Millie, Hairspray and Grease. Drama Desk Award nominee Gizel Jiménez joins the Broadway company of the long-running hit musical Wicked at the Gershwin Theatre tonight, as previously announced, assuming the role of Nessarose from Kristen Martin, who played her final performance on March 10. Gizel Jiménez makes her Broadway debut with Wicked. Her previous stage credits include a Drama Desk-nominated performance in Miss You Like Hell, as well as Party People, Rosario and the Gypsies off-Broadway, and the National Tour of West Side Story. He's a Sentimental Man! The Broadway company of the long-running hit musical Wicked welcomes Michael McCormick to the Gershwin Theatre tonight, as he assumes the role of The Wizard from three-time Tony Award nominee Kevin Chamberlin. Mr. Chamberlin played his final performance in the production on February 17, 2019. Michael McCormick's many Broadway credits include Hello, Dolly!, Chaplin, Elf, Curtains, The Grinch Who Stole Christmas, The Pajama Game, Kiss Me, Kate, 1776, Gypsy, Marie Christine, Kiss of the Spider Woman, La Bête, and Oliver! Wonderful! The Broadway company of the long-running hit musical Wicked at the Gershwin Theatre is getting ready to welcome two new Citizens of Oz this spring, as Michael McCormick and Drama Desk Award nominee Gizel Jiménez are set to assume the roles of The Wizard and Nessarose, respectively. Three-time Tony Award nominee Kevin Chamberlin will play his final performance as The Wizard this Sunday, February 17, with Mr. Thank Goodness! Katie Rose Clarke and Jesse JP Johnson return to the Broadway company of the long-running hit musical Wicked at the Gershwin Theatre tonight, assuming the roles of Glinda and Boq, respectively. Previous cast members Amanda Jane Cooper and Jye Frasca played their final performances in the production on December 9. Let's celebrate! The long-running hit musical Wicked, which recently commemorated its 15th Anniversary on the Great White Way, welcomes Tony Award nominee Nancy Opel and Jamie Jackson to the Gershwin Theatre tonight, as they assume the roles of Madame Morrible and Doctor Dillamond, respectively. Previous cast members Tony Award nominee Isabel Keating and Martin Moran played their final performances in the respective roles on November 18. Thank Goodness! Katie Rose Clarke will return to the role of Glinda in Wicked at the Gershwin Theatre, from December 11, 2018. 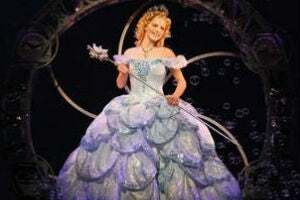 She will assume the role of Glinda from current cast member Amanda Jane Cooper, who is set to play her final performance on December 9, 2018. Clarke currently holds the record for the longest-running actress to play the role of Glinda on Broadway. She first played Glinda on the first national tour of Wicked from 2007 to 2009, later reprising the role on Broadway from January 14, 2010 to September 25, 2011 and again from April 23 to September 22, 2013. New citizens of Oz have been revealed for the long-running hit musical Wicked as Tony Award nominee Nancy Opel and Jamie Jackson are set to assume the roles of Madame Morrible and Doctor Dillamond, respectively, from November 20, 2018 at the Gershwin Theatre on Broadway. Current cast members Tony Award nominee Isabel Keating and Martin Moran are scheduled to play their final performances in the respective roles on November 18. In addition, Jesse JP Johnson will assume the role of Boq on December 11, with Jye Frasca playing his final performance on December 9. There have been moments in the history of musical theater when, like a twister, the sheer talent and whirling spectacle of a production have flattened any negative criticism that stood to get in its way. Take October, 2003 for example. That was the month that Wicked opened in New York to generally dour reviews.